Grateful to be the first recipient of the 2018 Carole A. Carlson Whale Naturalist Education Award, for my work with art as an educational tool. This grant will fund Tails of the Atlantic, for the construction of models and learning tools to communicate across language and sensory barriers. 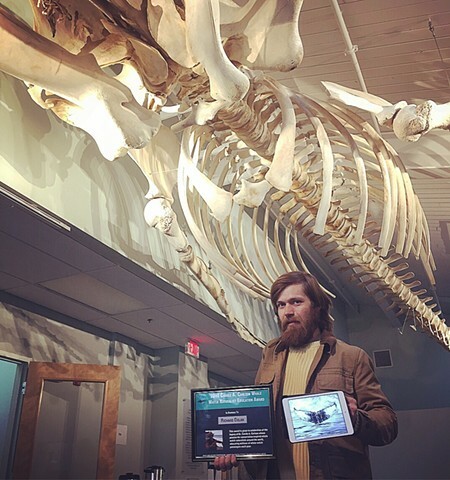 These 3-dimensional resources will be shared with whale watches of New England, and beyond. Thank you to Whale and Dolphin Conservation, the Center for Coastal Studies, and Dolphin Fleet Whale Watch for this honor, and to Carole A. Carlson for all she did for whale conservation and composing the naturalist workshop community. This project will be posted under Education on my website. My fluke illustrations "Crisscross", "Sundown", and "Shuffleboard" were selected for exhibition at the Scientific Illustration show at the FE Gallery in Sacramento, CA! My most recent work, "Milk Owl", has been accepted to "Collective" at Galatea Fine Art. The exhibit runs August 6th through the 29th 2010. The opening reception is on Friday August 6th, 6 to 9pm. Juried by Dina Deitsch, Assistant Curator at the deCordova Sculpture Park and Museum. Hours are 12 to 6pm Wed. through Fri. 12 to 5pm Sat. and Sun. I am going to have recent drawings and paintings displayed in Exposure at the Ceres Gallery. The show will run from December 14-20, 2009. I will be displaying work with friend Anthony Palocci Jr. The work is purely non objective and is relatively small in scale. It will be on display from March 23rd to April 18th of 2009.